A variation of enstatite, whose name is derived from the Greek word for “resistor”. Bronzite, often found in meteorites is iron-rich and is named for its sub-metallic lustre and sparkles of bronze light (schiller). 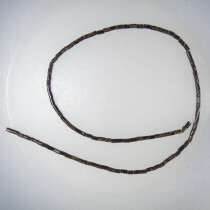 These dark brown beads show the typical chatoyant bronze coloured metallic areas. Bronzite Round 4mm Beads (~100pce Strand) - 40cm /16'" Strand. 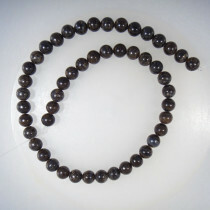 Bronzite Round 6mm Beads (~66pce Strand) - 40cm /16'" Strand. 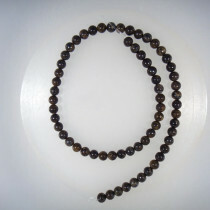 Bronzite Round 8mm Beads (~50pce Strand) - 40cm /16'" Strand. 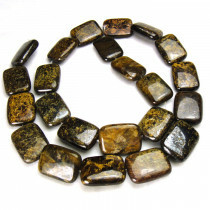 Bronzite Round 10mm Beads (~40pce Strand) - 40cm /16'" Strand. Bronzite 13x18mm Puffy Rectangle Beads (~23 pce Strand~) - 40cm /16'" Strand. 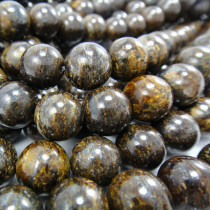 Bronzite 8x13mm Centre Drilled Nugget Beads (~49 pce Strand~) - 40cm /16'" Strand. 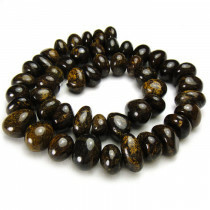 Bronzite 2x4mm Tube Beads (100pce Strand) - 40cm /16'" Strand.